The Minnetonka Tramper is one of the classic styles for women (men too) from Minnetonka. 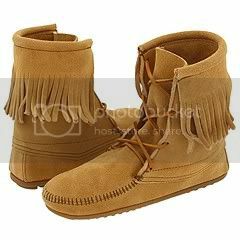 It has a timeless moccasin style with an earthy, comfy look and feel - set off with long fringe dangling from the shaft. Colors: This boot is available in Tan (shown in photo left), Black, Brown, Dusty Brown and Grey. Style: Suede upper, leather lacing, ankle height. This boot also features a padded insole to absorb shocks and a lightweight crepe outsole for easy wear and traction. Reviews information: I have a difficult time finding comfortable shoes. Mostly, I wear running shoes, but these mocs are so nice. They have the textured sole and are very comfortable and I've gotten compliments on how cute they are... Click here for multiple reviews for this boot.